Difficulty of Travel From Access Point: Easy (short, well traveled portages). We hadn’t planned on staying on this site. We were originally booked for Bandit, one lake east of Moccasin, but by the time we got to Moccasin it was getting late and all we wanted was a semi-decent spot to collapse and think terrible thoughts about my route-planning abilities. As far as places to collapse and think awful thoughts go, this isn’t a bad one. In fact, I’d go as far as to say it’s a pretty good one. It’s a nice, open site with good views and lots of room to spread out if you need it. Terrain: The site sits on top of a small rise. Coming up from the water you’re climbing a decently sloped expanse of exposed rock (let’s call it a 10-15 foot rise from water to top). In dry conditions, it’s not too challenging. If it were raining or the rock was slick you’d probably have to start thinking about your footing. The top of the hill, where the rest of the site sits, is decently flat. There’s decent tree cover ( which unfortunately includes one potential widowmaker smack dab in the middle of the tent area) without it being oppressive. The site feels sheltered as opposed to enclosed. Ground cover is a mix of dirt, pine needles and more pine needles. Canoe Landing: This is the trickiest part of using this site. There isn’t a natural disembarkation spot on the rock face. There’s one small crevice that you can sort of ram your canoe into, but regardless, getting out of the boat without getting in the water would be tricky. There are flat spots to step on below the water if you’re looking for stable ground to load/unload from. The underwater approach is nice and clear though, so you don’t have to worry about ramming into anything as you paddle up. Canoe Landing – Note the little V Harbour. A pit in which you can put a fire. A fire pit, if you will. Fire Pit: The fire pit is nicely situated at the top of the rock slope and from the pit area you’ve got a nice view southeast across the lake. The pit itself (which we didn’t use as we were there during a fire ban) wasn’t anything spectacular. Just a low circle of rocks, functional but unimpressive. You’d probably have to do some wall building if you wanted to prop a grill across the flames or if you were using the pit on a windy night. Swimmability: Definitely swimmable. The rock slope continues underwater, so you can sort of run down the rocks till you’re half in then dive in. The rocks are kind of slippery and (ugh) slimy, so climbing back up takes some concentration. Other than that, it’s a really nice place to take a dip. 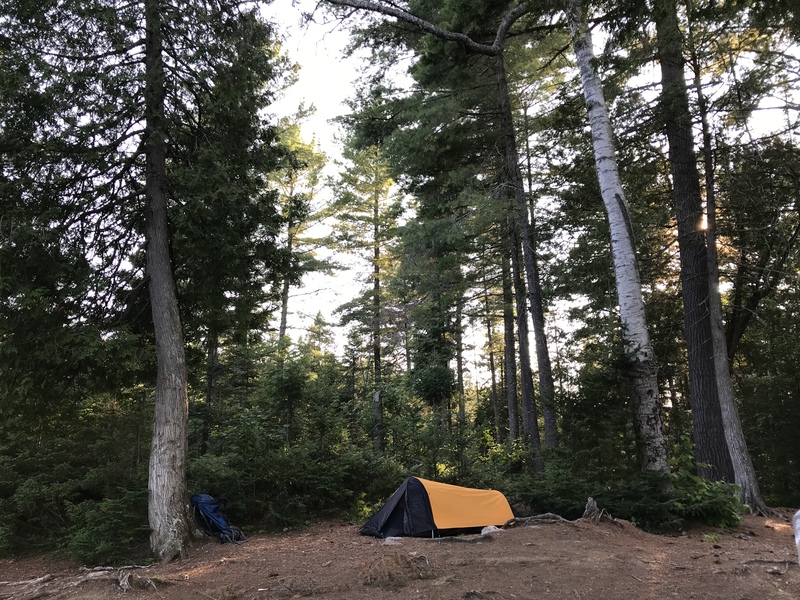 Tent Sites: There three obvious tent spots and a couple of other places where you could pitch a tent in a pinch. One thing to note, one of those obvious spots is directly underneath a very dead looking birch branch, so until that falls off I’d be hesitant about setting up there (which was exactly what I did until I looked up and saw the branch). There’s one nicely cleared out spot that would be good for a larger tent, and another smaller spot that worked well for my solo (and would fit a two man as well). Accessories: There’s an L of log benches around the fire pit, giving you a place to sit and admire both the fire and the view out over the water. There’s also a short standing grill that you could use as a small table or, I guess, as a grill. Someone has built a small but sturdy counter/table onto the side of a tree just beside the fire pit. Thunderbox: The thunderbox is in good shape and back of the site. Wasn’t suffering from overuse when I went through. There’s a bit of a walk between the site proper and the box, enough to ensure some privacy while you’re thinking deep thoughts. Views: There’s a very nice view south and east from the site. Apart from that, the trees surrounding the site are fairly thick, meaning the view in all other directions is obstructed. Notes: I liked this site. I don’t know that I’d want to set up camp on it for a few days, but it’s definitely a good stopping point for a single night. One thing, you’ve got a nice view of the brightly lit southern shoreline from where you’re sitting, but the location and tree cover means that you lose the sun off your own site pretty quickly.